I resolved to cook and eat more fish this year, and when Adam realized that included sardines he was pretty excited. The guy can bring a can of sardines and some crackers to work and happily call it lunch. I am not quite so good at the oily little fishes. I know, I know, but they're so little! And oily! Here's the thing, though: they're also delicious and sustainable. You can buy fresh sardines if you want (and you should, then you should butterfly them and pan fry them and serve them with orange beurre blanc), but since sardines are more or less shelf stable when canned, they make a great pantry item. Super fast dinner: cook them with boatloads of garlic and red pepper flake and toss it all with pasta. Nice and easy lunch: smash them up with cream cheese and a few other bits and bobs, then eat the mess on crackers next to a salad. This is adapted like crazy from Dorie Greenspan's Around My French Table; I didn't have the herbs her recipe called for, and I had an odd size can of sardines, so I just mashed and smashed until it tasted good. I am confident that you could take this in a whole bunch of directions, so trust your instincts and embrace the little fishes. To remove the spines and icky bits of the sardines, use a small knife to slit open the bellies and open up the fishes. The spines are soft, so be gentle, but you should be able to just pick them up and remove them quite easily. The icky bits will be obvious, darker and sometimes green. Just scrape them out. You should also remove any residual fins by cutting them away, but the skins are ok to leave on. Put the cream cheese in a bowl and bang it around with a fork, smush it all up. This is easier if it's at room temperature, but no big deal. Add several grinds of black pepper, the shallot, marjoram, and capers. Continue mashing and smushing. Add the sardines and the lemon juice. Continue mashing and smushing. Give it a taste to see if you need salt; you might not since the capers and sardines and cream cheese bring plenty to the table. 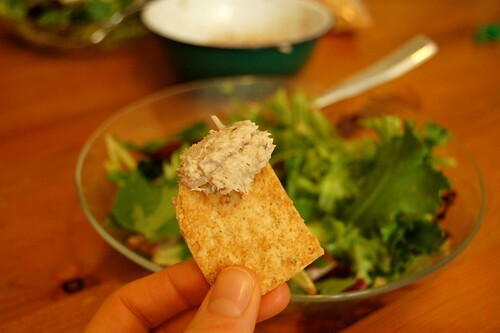 Now, cover the rillettes with plastic wrap and stick the bowl in the fridge for at least an hour or two. Taste it again before serving and adjust the seasoning if necessary. Are you chilly? It is winter, after all, and that makes it soup season. Let's get cozy. First, slice 5 pounds of onions. Thin, but not too thin; you're going to cook them for quite some time. Your eyes may water. Put half a stick of butter in a big, heavy pot. Turn on the flame, low. Stir every few minutes for two hours. After ninety minutes your onions will be sitting in a pool of oniony liquid and it will seem like they will never ever be done. Keep going! After two and a half hours your onions should be melty and dark golden brown, but if they're not, keep cooking. Sprinkle the melty onions with a tablespoon or two of flour and stir it in. Add a cup of wine and simmer till it's all gone. Add a cup or two of water and six cups of stock - chicken, beef, veal, duck, whatever you have. Homemade is great if you have it. If it's from a box, just make sure it's not crazy salty. Simmer the whole mess for another hour until it's silky and smooth. Now the fun part: add a little blorp of dijon mustard, a splash of Worcestershire sauce and a bigger splash of soy sauce. Grind in a lot of black pepper. Taste your soup and put it in a bowl. Slice some bread and toast it up. 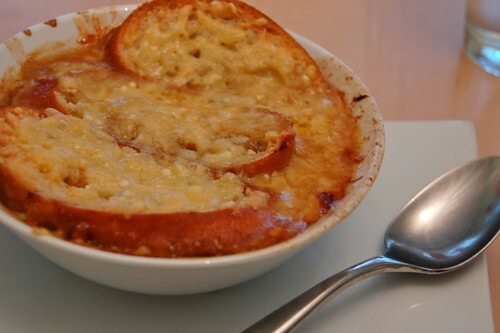 Put it on top of your soup and cover it in a pile of sweet, nutty cheese, then stick the whole mess in the oven until the cheese is melted and bubbling brown. Dig in. Last week at work we got to try raclette in the traditional way, heated up and scraped onto some potatoes, so it seemed an obvious choice to top this fancied up 'tater. Instead of broccoli and cheddar, why not broccoli rabe and raclette? The creamy nuttiness of the raclette stood up brilliantly to the bitter broccoli rabe. So yeah, sometimes we have baked potatoes for dinner. I actually bought these potatoes because we had lots of leftover chili after the Superbowl and baked potatoes with chili is an aaawesome repurpose of leftovers. Except then Adam ate all the chili for lunch. (I mean, not in one day, just that he ate three days worth of chili lunch.) The point is that after all that chili, a big pile of vegetables is super appealing. Do you do baked potatoes for dinner, or just as a side? What's your favorite tater topper? You don't have to use actual Swiss raclette if you can't find it, just something that style. I will say, however, that if you're having baked potatoes for dinner, springing for a fancy cheese is not a bad way to go. If you'd rather go domestic, Spring Brook Farm makes a great raclette style cheese. Preheat your oven to 375. Put a baking sheet on the bottom shelf. Poke the potatoes all over with a fork, then rub them with a thin coat of vegetable oil and rub a generous amount of salt on the skin. Put the potatoes directly on the top rack of the oven. The baking sheet is there to catch any drips, and will probably be annoying to clean later, so you may want to put some foil on it first. After 30 minutes, turn the potatoes over. It should take 45 minutes to an hour for the potatoes to become tender all the way through (poke them with a thin knife to find out). While the potatoes are baking, bring a large pot of salted water to boil. Blanch the broccoli rabe for 1-2 minutes or until tender. I spread it out on another cookie sheet to let it dry/cool faster, but you could also shock it in ice water and drain it. I just used it as is, but if you wanted to saute the blanched broccoli rabe in butter to warm it up, that would be good too. Grate the raclette as best you can on the large holes of a box grater. It will be a little smushy, but that's ok. When the potatoes are done, open them up. I like to cut them open (not all the way through to the bottom) the long way, and then make 2 cuts the other way so I end up with six potato segements. 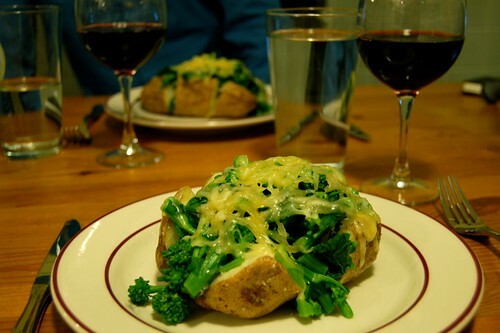 Season the potato insides with salt and pepper, then top with the broccoli rabe and raclette. Put the topped potatoes on a baking sheet (the one that was in the oven or the one that had the broccoli rabe on it) and stick them in the still-warm oven for a few minutes until the cheese melts. Today is my birthday. I am 29 years old. For the last month I have been realizing that there is a list of things I’ve been meaning to get done and it seemed like a good idea to write them down. So here it is, friends. Thirty things to do by thirty. I’ve got a year to get it done. I’ve organized it into categories, and I’ll blog about things as I accomplish them. Have you ever made a list like this? What do you think of mine? And do you have any book recommendations? Make sausage. Probably turkey breakfast sausage. Dinner Party 1: gussied up American food. I have a menu in my head that starts with buffalo brussels sprouts and ends with a giant hostess cupcake. Dinner Party 2: food and wine pairings. Roasted lamb and a big fat red. Oysters and champagne. The classics. Make croissants. Danish and croissant were both on one day at school and I ended up making danish... and I’ve been making them ever since. I’d like to try croissants, too. Make duck prosciutto. There’s a wet-cure recipe from Bon Appetit that looks like something I can handle. Go back to Europe. Kind of a cheat, since I’ve got a trip to Paris planned (with my mom and my sister!) in April. Complete Project 365. I made it to 270 or something last time, but then I got distracted/married. Find a way to sell or give my wedding dress to someone who needs one. I don’t know how, but I don’t need it anymore. Watch the Godfather trilogy. Because I’ve never seen it. Read 30 books. Looking for suggestions. What’s your favorite read? Purge cookbook collection. The ones I don't use are getting donated. It's time to curate instead of collect. Figure out what to do with the 401(k) I left at my old job almost two years ago. Roll it over into something? I don’t know. Put together a wedding album. You know, from our wedding a year and a half ago. That we already paid for. Heh. Get not-ugly hampers for the bedroom so I can take the ugly ones out of the guest room. Clean out under the guest bed and throw away some crap. Clean out the giant black trunk in the basement and throw away some crap. Move DVDs to sleeve books and chuck the cases to make space on book shelves. Figure out if my sewing machine is broken or not, and if it is, fix it. Once sewing machine is fixed, make curtains for the living room. Find a yoga studio I like. There are 2 or 3 within a ten minute walk of my house. Surely one of them will be a fit. Do two chin-ups in a row. Right now I can do 3/4 of a chin-up, but that's it. Run a 10k in under an hour. Last year I did it in 1:03 and change, but it was 85 degrees that day. I can do better. I don't know if you guys have heard, but there's kind of a big game on this weekend. Heh. Vegetarian sportsfan? Make 'em some potato and green chile stew. And everybody loves buttermilk biscuits for dunking. Baked cheddar olives look good on the snack table. Maybe right next to the guacamole? If you're heading to someone else's house, sweet and spicy nuts travel well. Have a great weekend, guys, and go Pats!